Human hearing is limited to a range of frequencies between around 20Hz to about 20kHz. But recent science has been examining exactly what we mean by “hearing”. A human ear has in fact been shown to respond to a frequency as low as 15Hz under laboratory conditions. And if the amplitude of the wave is big enough—as any rave party-goer will tell you—you’ll probably be able to feel those deep low notes in your body. A similar question centres around the “dog whistle” frequencies above 20kHz. The science of what’s often called “ultrasound” is more controversial, although there’s no doubt about the acute sensitivity of the ear to the minute changes of pressure of those upper frequencies. Vendors of “Hi-Res” audio equipment suggest that these technically inaudible high frequencies contribute to the sense of “presence”. It’s a distinctly moot point. Optoma, the projector company which entered the audio market at the end of last year with its acquisition of NuForce, has supplied some review samples so we can explore this question. Let’s see if the Nuforce µDAC5 and the HEM4s can throw some light on it. OPTOMA’S HEM SERIES ARE IN-EAR HEADPHONES (or more accurately, “in-ear monitors”, or IEMs for short—don’t dare call them “earbuds”) that are said to have a frequency range of “up to” 40KHz. I think we’ve become a little wary of these “up to” claims—whether it’s your ISP’s broadband speeds, or (by far my favourite piece of meaningless puffery) TK Maxx’s resounding “Always Up To 60% Less”. The HEM part stands for Hi-res Ear Monitor, and the digit that follows indicates the total number of separate transducers in the pair. So each earpiece of the HEM4 has two transducers, covering the upper and lower frequencies. There are three other HEMs in the range: the HEM2, the HEM6 and the HEM8. Prices are serious: they start at £200 for the HEM2 and run up to £450 for the HEM8. The technology is genuinely serious too—this is definitely not a Beats-type stitch-up. The transducers (other people tend to call them “drivers”, but it’s a vague term that means something quite different in the software world) are manufactured by the Knowles Corporation of Illinois. Knowles delivered the world’s first miniature microphone and receiver for hearing aids in the mid-1950s. The transducers use “balanced armatures”. 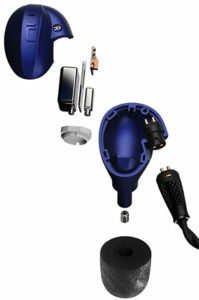 These devices employ a quite different principle from the “dynamic” transducers you’ll find in most regular earbuds. 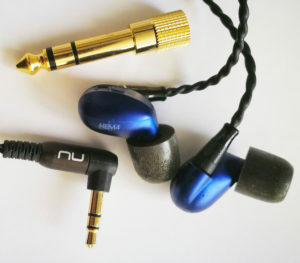 Unlike earbud dynamic transducers, which are essentially general purpose coil-driven loudspeakers boiled down to fit inside your ear, balanced armature mechanisms have rethought the whole electromagnetic design around miniaturisation and efficiency. The armature is a tiny see-saw pivoted in the centre of an electromagnetic field. Very slight changes in the current fed to the electromagnet (the incoming analogue signal) cause the see-saw to rock. This motion is passed mechanically to a diaphragm, turning it into sound waves. This approach makes it possible to construct very small components that punch well above their weight in terms of sound output. But efficiency isn’t the principle benefit: the audio industry particularly relishes the way the balanced armature design can be delicately tuned to manage particular frequencies. Tuned transducers in each of the HEM4 earpieces can split the frequency range between them: the larger one handling the bass and the smaller one the treble. Most hi-fi living room speakers do much the same thing, and as with those full-scale speakers it’s possible for balanced armature headphones to make multiple splits, feeding the frequency range across a number of differently tuned transducers, which is what the HEM6s and HEM8s do. But crucial to this split-frequency design is “crossover”, the problem of attaining a smooth final output with no frequency gaps. At the point where the high and low frequencies are split there needs to be an overlap, with both transducers pumping out the same frequency range. It’s essential that the transducers are “phase coherent“, otherwise at the crossover the waves will be cancelling one another out. The aim is to make the two transducers (or more in the case of the HEM6 and HEM8) behave exactly like a single seamless sound source, but one that smoothly reproduces all the frequencies across its extended range. As with a full-sized loudspeaker, accurate reproduction doesn’t only depend on the fidelity of the transducers or the smoothness of the crossovers. The third key feature—and this is make-or-break—is the design and quality of the enclosure. In any sound reproducing system it’s the forwards and backwards movement of the front of the transducers diaphragms that creates the desired sound waves. But this is necessarily accompanied by a backwards and forwards movement at the rear of the diaphragms that is pushing air in exactly the opposite direction. The ideal enclosure loses these rear perturbations completely. But mounting your transducer in a solid, acoustically impervious wall and letting your neighbours deal with the back-end nuisance is seldom a practical solution. Instead, the HEM series uses a curiously snail-shaped enclosure made of Lexan, a proprietary lightweight thermoplastic polymer resin used in jet fighter canopies for its strength, impact resistance and—particularly significant in audio applications—mechanical stiffness. In musical instruments like violins the vibrations of the enclosure give depth and character to the notes being played. But devices designed for faithful reproduction absolutely should not have a voice of their own. The stiffness of Lexan resists the tendency of the HEM4 enclosure to resonate in sympathy with the sound waves being delivered, so you get nothing more nor less than what the input signal is meant to deliver. The pair of IEMs is fed through a tough, tangle-resistant plaited detachable cable. Two of these are supplied, one includes a microphone for conventional use with a phone. 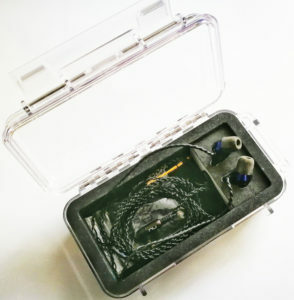 The package also includes three sizes of silicon tips and an additional pair of the more expensive Comply soft foam ear tips that shape themselves to your ear canals, providing a firm, acoustically sealed fit. The whole set comes with a water-tight and air-tight polycarbonate case, a fabric pouch, a cleaning tool, and 3.5mm to standard jack plug adapter. If the extended frequency story has any merit (and I think it does) you’re unlikely to get the full benefit of the HEM4s by plugging them directly into your phone or laptop. This is where the pocket-sized, USB-powered µDAC5 comes in. Your phone, notebook or desktop computer isn’t primarily designed as a hi-fi device. The premise behind the µDAC5 is that these conventional sound systems will be compromised in some way. 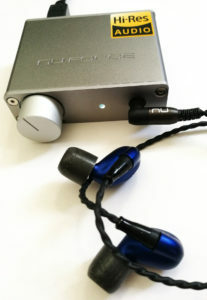 Although good enough for driving regular dynamic headphones—and these days very likely able to handle at least the lower range of Hi-Res sources—being packed into the chassis of an electrically noisy digital device isn’t the best place for digital hi-fi components that will tend to pick up electronic activity running along the main bus. 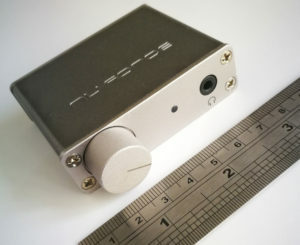 The µDAC5 is an independent digital to analogue converter (DAC) combined with a headphone amplifier designed as a complete replacement for the sound system in your notebook or desktop computer when connected through the USB A to USB B cable, supplied with the kit. Other mains-powered devices like the nVidia Shield can also drive the µDAC5. No extra software’s needed; all the modern operating systems include support for USB audio (except for Windows—for some reason you’ll be prompted to download extra drivers when you connect the µDAC5). In theory, the µDAC5 should also be able to work with most phones using an OTG (On the Go) adapter, but the high power the µDAC draws though the USB interface makes this impractical. The µDAC5 is clad in a solid stainless steel case to give it excellent electromagnetic isolation. The front panel has a friction-damped volume control on the left, which also incorporates the on-off switch. Power on is confirmed with a small LED in the centre of the panel and to the right of this is a 3.5mm audio output socket. At the rear of the unit is the USB B input socket and three RCA output connectors. Two of these are a left-right pair of analogue audio channels and the third is a coax digital audio output. These outputs allow the µDAC5 to supplement any conventional hi-fi or powered loudspeaker system. Don’t confuse the Nuforce µDAC5 with the similarly sized NuPrime µDSD. When Optoma bought Nuforce the higher end product line was hived off to a new company run by the original NuPrime founder. The NuPrime µDSD includes a dedicated DSD decoder that is lacking in the NuForce product. The µDAC5 also handles what some manufacturers claim to be the highest end of high end audio, a recorded sound format called Direct Stream Digital, or DSD for short. DSD can faithfully record frequencies up to around 100KHz, and is the format used for Super Audio CD (SACD), the extended audio delivery system introduced at the end of the last century and now largely abandoned. 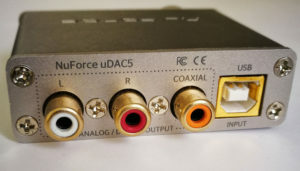 Unlike the NuPrime version (see box) the NuForce µDAC5 lacks dedicated DSD hardware, but can handle a version of DSD called DoP (DSD over PCM). DoP requires the incoming stream to be repacked (no transcoding, so no loss of information) into PCM. Pulse Code Modulation, to give it its full name, is the format used by CDs, and the repacked DoP stream only requires a special header to inform the DAC to treat the data as DSD. Every nuance of the original DSD stream is maintained. The indicator LED on the µDAC5 will turn from white to blue to indicate that a DoP stream is being processed. Where does this “repacking” take place? In my tests I used two apps: the free software Foobar2000 and JRiver’s proprietary Media Center. I’m a huge advocate of free software, if only because it is usually platform agnostic. But in this case I have to take my hat off to JRiver. Foobar2000 is Windows-only: it’s the JRiver app, not Foobar2000, that runs on Windows, Mac and Linux. I also found the JRiver app much easier to set up and use, and far better at reporting what it was actually doing with the audio streams it was handling. The niche DSD format has evolved to include up to 6 audio channels for super-surround sound but the µDAC5 can only cope with two channels. This is appropriate for what is essentially a headphone DAC-amplifier. But it means that some of the latest DSD tracks simply won’t play directly through the µDAC5. This is where the multi-talented JRiver Media Center comes to the rescue. With its built-in transcoding and repacking features it can slim down any multichannel stream to a stereo stream and even transform DSDs into the more ubiquitous FLAC format for equipment that can’t handle DSDs. Bottom line: the combination of JRiver’s Media Center and the µDAC5 was able to play everything I was able to bung at it with minimal loss of quality. Do the HEM4s Deliver Their Promise? Driven through the µDAC5, I found the difference between the HEM4s and my best (Sennheiser) over-ear headphones subtle but distinct. More pertinent was an A-B test against NuForce’s own NE800Ms. These are very respectable conventional dynamic transducer powered earbuds, finely crafted from carbon fibre and brass that you can pick up for a little under £80 if you shop around. My ears have a combined age of 150 years, so you’re very likely a much better test subject than me when it comes to high frequency detail in music. But even to me the difference the HEM4s make was definitive. Although the NE800Ms sound pleasantly warm, with a deep rich bass, even CD quality tracks are distinctly more clearly defined through the HEM4s. The difference between CD quality and 24/96 tracks was barely discernable with the NE800Ms, but the HEM4s brought a distinct crispness to 24/96 tracks, with more precise placing of the individual instruments and an improved sense of actually “being there”. To be frank, I don’t really have a conclusion. The science debunking the wilder claims of “Hi-Res” vendors seems to me solid enough. But my experience of playing 24/96 FLAC directly into my ears through the µDAC5 suggests that the extended dynamic range of 24-bit quantization may have some tangible benefits. And this intimate connection with the music certainly gave me a sense of those dog-whistle high frequencies and technically inaudible low notes. Perhaps not recognisable as distinct sounds, but—and here I can only lapse into the poetic clichés of the audiophile reviewer—as “presence” and “a broadened soundscape”. Regular on-ear dynamic headphones, unless you’re using some kind of spacialising DSP, bottle up the music inside your head. With good quality input, the HEM4s seem quite distinctly to move the music out into the space around me. Whether this difference is worth in excess of £100 to you will depend on the depth of your purse and the seriousness of your interest in music.